The only problem with chocolate is summer. This Mediterranean girl loves her some sun, but the chocoholic in me dreads that time of year when chocolate is one of the last things I’ll want to reach for. Thankfully, there’s a summer-dessert saviour: lemon. 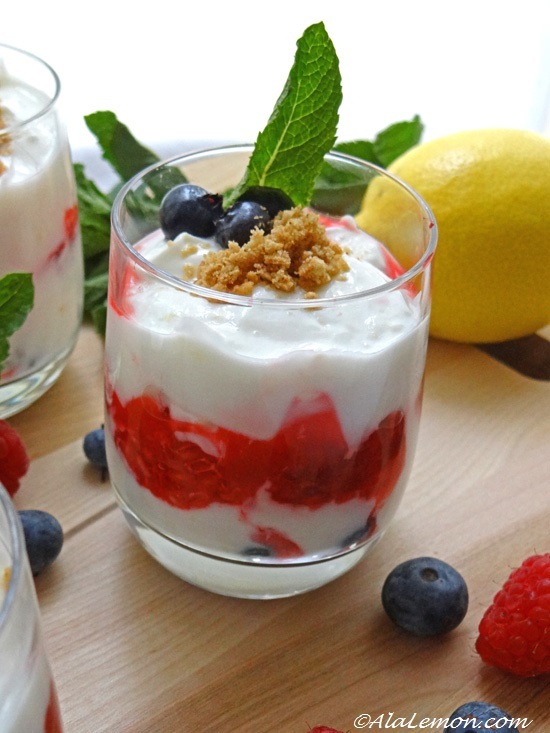 Can’t beat a nice, fresh, lemony dessert in the summer, can you? Unless it’s a dark chocolate sorbet, in which case it’s debatable. And this one is light and fresh and as easy as it gets to whip up! Line a fine sieve with a paper towel and allow the yogurt to drain for about an hour. Don’t leave it longer or it will dry out. In a bowl, combine 1 tbsp Limoncello and 1 tbsp lemon juice. Add the blueberries and toss to coat. In another bowl, repeat the procedure with the raspberries. It’s OK if the raspberries get a little mashed in the process. Let the berries macerate for about 30 minutes. Tip the yogurt into a bowl, add the lemon zest and juice, 1 tbsp icing sugar and mix well. 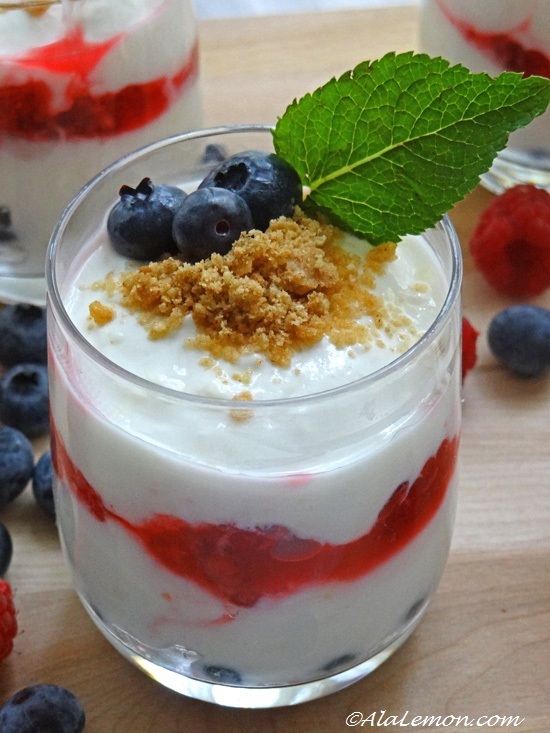 Adjust the sugar and lemon juice – the cream should be tangy but not too sweet. Cover the bottom of serving glasses or small bowls with blueberries. 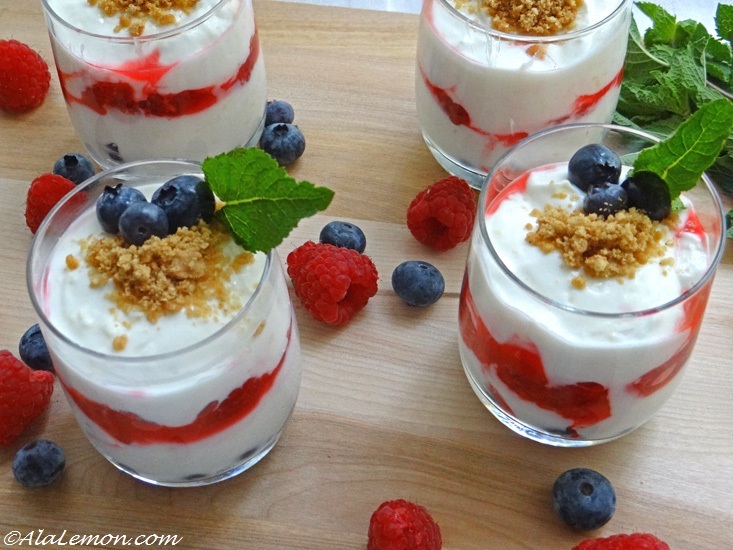 Top with a nice dollop of yogurt, then a layer of raspberries, and another of yogurt. 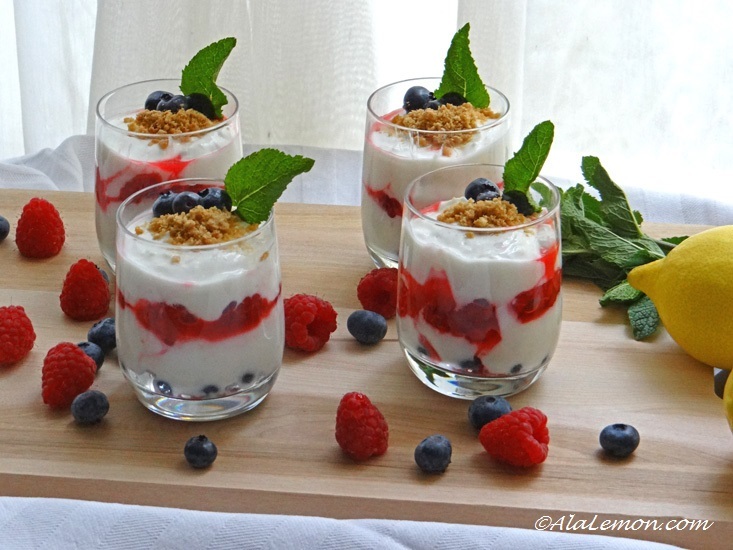 Decorate with crushed biscuits, leftover berries and a mint leaf.